A full-length reunion with Jim Steinman, who not only writes all the material here but acts as sole producer as well, this is easily Meat Loaf’s best album since the original Bat Out of Hell. It does admittedly stop short of recapturing the majesty of the original, if only for three reasons: it’s noticeably not nearly as warm-sounding as the original; the songs are just way, way too long for their own good (six of the eleven cuts surpass the seven-minute mark, while two of those last for over ten minutes); and, lastly, Todd Rundgren has no involvement this time around beyond singing and arranging background vocals. But, those three issues aside, Meat Loaf hasn’t sounded this inspired and energized in over a decade, and Steinman brings a delightful set of songs to the table here (even if quite a few of them are technically re-recordings of songs he’d already done on his own on Bad for Good or Original Sin). 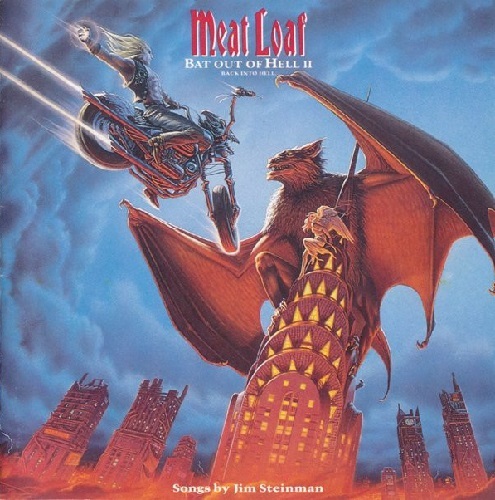 Meat Loaf’s version of Steinman’s earlier solo hit “Rock and Roll Dreams Come Through” surpasses the original (as do his versions of the Bad for Good cuts “Lost Boys and Golden Girls” and “Out of the Frying Pan (and Into the Fire)”); “Objects in the Rear View Mirror May Appear Closer Than They Are” is practically a mini-opera in its own right; and the album also boasts Meat Loaf’s first and only Number One hit, the fiery and melodramatic epic “I’d Do Anything for Love (But I Won’t Do That),” which boasts an absolutely brilliant ending that makes great use of featured vocalist Lorraine Crosby. If you only pick up one other Meat Loaf album besides his debut, this should be it. Strangely, Meat Loaf followed up his massive comeback with an album that just barely has anything in common with its predecessor. Mind you, it still sounds like Meat Loaf, but unlike Bat Out of Hell II, this isn’t really a concept disc or a collection of sweeping epics, nor does it even have a completely unifying vision, the production duties actually varying from track to track, bearing different combinations of Ron Nevison (best known for his work with Heart), Steven Van Zandt aka “Little Steven,” Sammy Hagar (who both wrote and serves as Meat Loaf’s duet partner on “Amnesty Is Granted”), and Meat Loaf himself. But Jim Steinman is nowhere to be found here, either as a co-producer or musician, though Meat Loaf tries to compensate for that by covering two songs from Steinman’s back catalog, the excellent “Left in the Dark” and the title cut from Original Sin. But most of the songs come from other parties entirely: in addition to a Tom Waits cover (“Martha”), you also get two songs from – bizarrely enough – Diane Warren (who, despite writing a lot of pure dreck in the late Nineties, actually wrote a lot of fabulous pop songs earlier in her career, including Belinda Carlisle’s “I Get Weak,” DeBarge’s “Rhythm of the Night,” Starship’s “Nothing’s Gonna Stop Us Now,” and Laura Branigan’s “Solitaire”). Warren does her best to try to imitate Steinman’s style on “I’d Lie for You (and That’s the Truth),” but she can’t quite mimic the epic visions and tongue-in-cheek humor of his best work and, though it’s still a reasonably good song, it consequently ends up just sounding more like arena-rock than the theatrical rock Meat Loaf is known for. “Where the Rubber Meets the Road” and “Runnin’ for the Red Light” are moderately memorable, but ultimately, it’s the two Steinman songs that stick out the most, and you can’t help but wish there were more of them here. An astounding eight years after his last disc (the longest gap yet between Meat Loaf releases), Meat Loaf returns with this fairly schizophrenic release. Steinman is nowhere to be found at all here – not even in the writing credits – and Couldn’t Have Said It Better is consequently the first Meat Loaf disc since Blind Before I Stop to not feature a single Steinman tune. Without his usual partner-in-crime around to help give the disc a vision, Meat Loaf seems a bit unsure as to how to progress forward, so he tries a little of everything: he does several covers, ranging from Bob Dylan’s “Forever Young” to K.C. Douglas’ “Mercury Blues” (a huge country hit in the early ‘90s for Alan Jackson); he dips back into the well of Diane Warren tunes while also utilizing material from the likes of Better Than Ezra’s Kevin Griffin; and he revisits his post-Steinman habit in the late ‘80s of playing up his more hard-rock or metallic side by bringing in Motley Crue’s Nikki Sixx to pen several tunes. The album’s middle third – highlighted by cuts like Griffin’s “Testify,” Sixx’s “Man of Steel,” Warren’s “You’re Right, I Was Wrong,” and “Tear Me Down” – goes a long way towards redeeming the disc, but the disc’s cover-heavy closing stretch leaves the lingering impression of an artist who may be having a lot of fun here but doesn’t seem to completely know what he wants artistically long-term for himself without his usual sidekick around. Steinman may not be actively present here – he neither produces the disc (that job falls instead here to famed industry “song doctor” Desmond Child) nor appears here – but his influence is still very much felt here and not simply because the disc contains seven Steinman tunes, most of which are re-recordings from the writer’s back catalog, such as “It’s All Coming Back to Me Now” (done here as a duet with M2M’s Marion Raven and arguably superior to the Celine Dion version), the title cut from Bad for Good, and a cover of the Pandora’s Box tune “The Future Ain’t What It Used to Be” re-done as a duet with, incongruously enough, Jennifer Hudson! Meat Loaf was wise enough this time around to build the disc around a Steinman-like vision and create another conceptual-like piece loaded with the trademark sweeping, oft-Wagnerian epics that made him a star in the first place, so even if Steinman wasn’t technically involved in the disc, it feels as if he was and that makes a big difference, and while much of the same writing personnel from the last disc return (including Nikki Sixx and Diane Warren), the disc feels much more unified overall than Couldn’t Have Said It Better. It doesn’t exactly rank up there with the first two Bat Out of Hell albums and can occasionally seem downright bad or a parody of his past work, but, like the Bat Out of Hell albums (or Bad for Good, for that matter, which is perhaps an even better comparison, actually), this disc is so completely gonzo that even the low points (like the metallic title track) make for a wildly entertaining train wreck, and cuts like “Bad for Good” (featuring Queen’s Brian May on guitar), “Seize the Night,” and “It’s All Coming Back to Me Now” are Meat Loaf’s best moments since at least the mid-Nineties. One noticeable pattern throughout Meat Loaf’s career is that, without Steinman around to arrange and produce or at least contribute material, Meat Loaf has been hesitant to stick with the same brand of theatrical pomp-rock that is his strongest suit and instead skews more towards hard-rock or even nu-metal territory, and he does so again here on this Rob Cavallo-helmed affair. (Steve Vai even pops up on more than one cut here.) The album’s biggest problem is that it simply seems too desperate: perhaps realizing that the disc would be a harder sell without the Bat Out of Hell title or any Steinman songs to help retain longtime fans, Meat Loaf tries to compensate by drafting lots of guest stars and all-star writers – too many, in fact. Brian May, Steve Vai, actors Hugh Laurie and Jack Black, and American Idol judge Kara DioGuardi all make appearances here, while the writing crew includes Jon Bon Jovi, The Darkness’ Justin Hawkins, Switchfoot’s Jon Foreman, and Our Lady Peace’s Raine Maida. Meat Loaf and his all-star crew do their best here to try to mimic the sheer ridiculousness of the Bat Out of Hell discs, but they miss the target in one very crucial way: with Steinman, you get the sense that he knows what he’s doing is so completely berserk that there’s a humor to be found in it and embraces the fact, but this crew, on the other hand, doesn’t really seem to get the joke and give the material the warmth and tongue-in-cheek approach it needs to work, and they’re all so busy trying to make it all sound large and arena-ready that they don’t pay as much attention to the melodies as they perhaps ought to. There are some undeniably fun moments here – just try not to smile while listening to the Jack Black duet “Like a Rose,” for instance – but, like Couldn’t Say It Better, there are just too many moments here where Meat Loaf sounds either desperate or lost in the wilderness for this disc to really feel nearly as satisfying as any of the Bat Out of Hell discs. 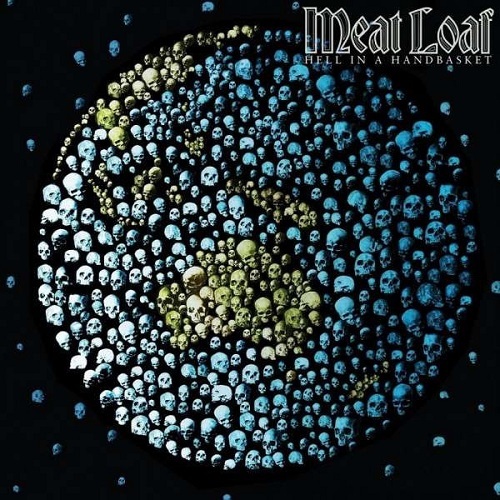 Arguably his least essential post-Bat Out of Hell II release of all, Meat Loaf – working without any Steinman tunes for the second album in a row – sounds more lost than ever on this forgettable disc. Like Couldn’t Say It Better, there are some cover tunes scattered here and there (including the Mamas & the Papas’ “California Dreaming” and Tom Cochrane’s “Mad, Mad World”), and like Hang Cool Teddy Bear, there’s a bunch of really incongruous and ultimately needless cameos here, including – brace yourself – rappers Lil Jon and Chuck D, Sugar Ray’s Mark McGrath, and country star Trace Adkins. There are some appealing moments here – particularly “Another Day” and the album-closing “Fall from Grace,” as moving as Meat Loaf has sounded in quite some time – but there are too many failed experiments (“Stand in the Storm” will certainly make you wince) and moments that verge on self-parody to make this a particularly coherent listen. His voice might not be what it once was, and his best work might be behind him, but all the same, it’s really refreshing to hear Meat Loaf get back to doing what he does best of all, and this is the first album penned entirely by Jim Steinman that Meat Loaf has made since Bat Out of Hell II. (The production, however, is left entirely to Paul Crook.) The disc also marks the return of both Meat Loaf’s original Bat Out of Hell duet partner, Ellen Foley, and her touring replacement, Karla DeVito, as well, and both women acquit themselves nicely on the near-twelve-minute “Going All the Way (A Song in 6 Movements),” a song that might be an obvious attempt at rewriting “Paradise by the Dashboard Light” but is quite fun all the same and proves to be one of the album’s highlights, alongside other strong cuts like “Loving You Is a Dirty Job (But Someone’s Gotta Do It)” (previously recorded in the late ‘80s by Bonnie Tyler as a duet with Todd Rundgren), “Only When I Feel,” “Train of Love,” and “Souvenirs.” Not only are the songs generally good for the most part, but there’s definitely a sense of focus here that was lacking from Meat Loaf’s last several albums, and the disc consequently ends up being his most satisfying release since at least the third Bat Out of Hell disc, if not perhaps even his second.